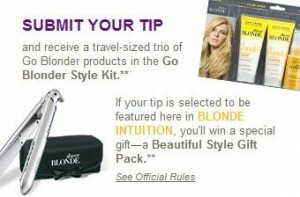 Click here to visit the John Frieda site and on the right of the screen, submit a 2-3 sentence tip on how to make “brittle blonde soft and touchable?” For doing so you’ll receive a free travel-sized trio of Go Blonder products. If your tip is selected to be featured on Destination Blonde, you’ll win a Beautiful Style Gift Pack, which includes an exclusive John Frieda® Hair Care Sleek Finish 1-inch Flat Iron and a chic, and Sheer Blonde® makeup-accessory bag. I was born blonde but became brittle with age. I use the smooth shampoo, and frizz ease. It makes my hair feel like it did when I was a child. My blonde hair turns dry and brittle in the summer when I life guard at the local pool. I love using the Frizz Ease on it, it makes it smoother and more manageable. No longer have have trial size trio available. Always rinse your hair with tap water when you get out of the salt water or chlorinated water. Bottled water works too! how to make “brittle blonde soft and touchable? use hot oil treatments onced a week, also use the born blonde shampoo and conditioner. I tried since this morning not very nice I could never get to the free stuff. I am blonde by my request but it so hard to keep the shine and the glow. I am tired of the chamomile because it dries my hair but the fried blonde give me the brittle blonde soft and touchable that makes me feels so real. I live in the upper Pennisula. The winters are very harsh on your hair. I have to Dry and staighten it. I love the sm ooth shampoo, and conditioner, I love the Frizz eaze. My hair is touchable and beautiful everyday.